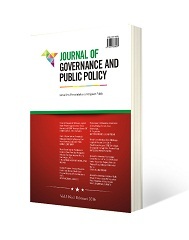 Journal of Governance and Public Policy is the journal published three times yearly: February, June, and October by the Master of Government Affairs and Administration, Postgraduate Program, Universitas Muhammadiyah Yogyakarta, Indonesia collaborate with Asia Pacific Society for Public Affairs (APSPA) http://apspa.org, Asosiasi Dosen Ilmu Pemerintahan Indonesia (ADIPSI) http://www.adipsi.org/, Asosiasi Ilmu Pemerintahan Perguruan Tinggi Muhammadiyah (AIPPTM) http://aipptm.com/, Jusuf Kalla School of Government (JKSG) http://jksg.umy.ac.id/. The journal's international content offers genuine valuable source for scientists and public policy makers in all areas looking for distinctive ways of dealing with related issues. Distinguished contributors from all over the world present in-depth research and studies which have tangible practical values and whose methodologies can be applied to solve or mitigate parallel situations. Published article is assigned with a DOI number. Article submissions in JGPP is done by OJS or online submissions (not by email, except trouble in register).